Zaha Hadid’s monument, her latest building to open in Baku, the capital of Azerbaijan, exemplifies an artistic vision which is taking shape now on a monumental scale. Again this project hasn’t been entirely devoid of controversy. At the London opening of the new Serpentine Sackler Gallery, the broadcaster Jeremy Paxman was questioning the funding off such building projects in countries with human rights issues. Hadid responded that she wouldn’t design a prison, and this project is something for people in the Republic of Azerbaijan to enjoy. In the same way as Frank Gehry’s architecture, Hadid’s buildings demand attention; they are immediately recognisable. 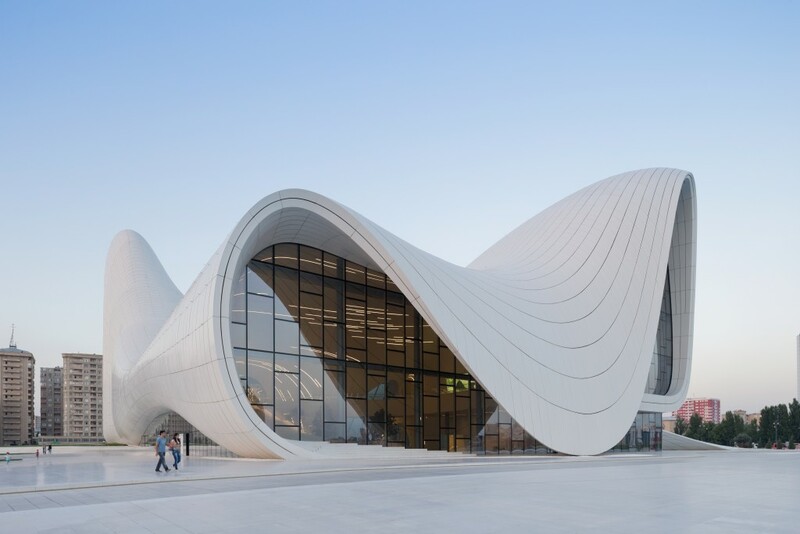 The floating forms of the Heydar Aliyev Center , created by complex computational programs and imagined as spatial structures, have a big role in building a new identity for the city. Baku is the capital of a former Soviet state, rich in oil and looking to build a strong cultural identity. Like a grand wavelike gesture, Hadid’s architecture will symbolise yet another shift in global consciousness. In the same way as beautifully designed cultural buildings elsewhere, this one too will certainly become a central meeting place, drawing young people to itself. It’s landscaped surroundings invite social interaction; large surfaces which seem perfectly suited for skaters to take over. And the interior spaces, with an auditorium, library and museum, will be a rare opportunity to experience complex public spaces by Hadid on this scale.